Our Pelham Pest Control Exterminator will identify the source of the pest infestation and create a customized treatment plan to eliminate the pests. 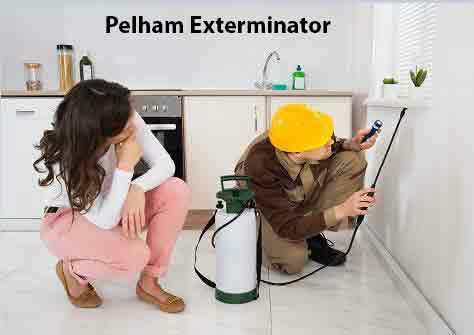 Let us be your Pelham Exterminator that you can Depend On, Give Us A Call Today. 1-844-305-8999. Bed Bugs are a very common problem for residents of Pelham NY. Bedbugs are small, flat, wingless insects with six legs that feed on blood from animals or people. They range in color from almost white to brown, but they turn rusty red after feeding. Bed bugs are nocturnal, feeding at night, often biting people who are asleep but can appear during the daytime hours as well if your home or business is not well lit. Bed Bugs feed on your body for a period of 3 to 5 minutes, after which they are engorged and drop off. Our Pelham Exterminator are experts at Eliminating Bed Bugs from your home or property. Call Us Today for a Bed Bug Inspection. Centipedes are in abundance in Pelham NY homes. They are predaceous, feeding on insects, spiders and other small insects they may find in your home or business. They do not cause damage to plants as Millipedes do. Centipedes have one pair of legs for each body segment and upwards of 15 pairs of legs total. Centipedes can bite and are poisonous. The poison from their fangs, located behind the head, is used to kill insects, which are their primary food. If you have Centipedes in your home and would like them eliminated, Give our Pelham Exterminator A Call Today. Most bees and wasps that are a stinging problem are social insects. This means that they generally occur in large numbers in the same nest. Because they are present in Pelham NY in large numbers they will start to affect you when they nest on your property. A bee or wasp or hornet problem in your home or yard can disrupt daily life and put both you and your family in danger, the only effective control is to locate and destroy the nests. Our Pelham Exterminator specializes in the removal of Bee Hives, Wasps Nests and Hornets Nests.